Two flats set high on Argyll Terrace with exceptional views over the bay. 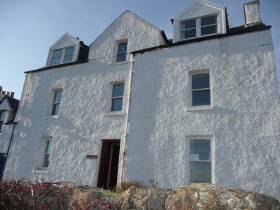 These flats have just been refurbished for self catering. Just a few minutes walk to Main Streeet. Upper Thornliebank has sitting room with woodburner, a separate kitchen and 2 bedrooms. Mid Thornliebank has a big kitcen/ dining/ living room and 3 bedrooms. They would be ideal booked together for a larger group or 2 families.